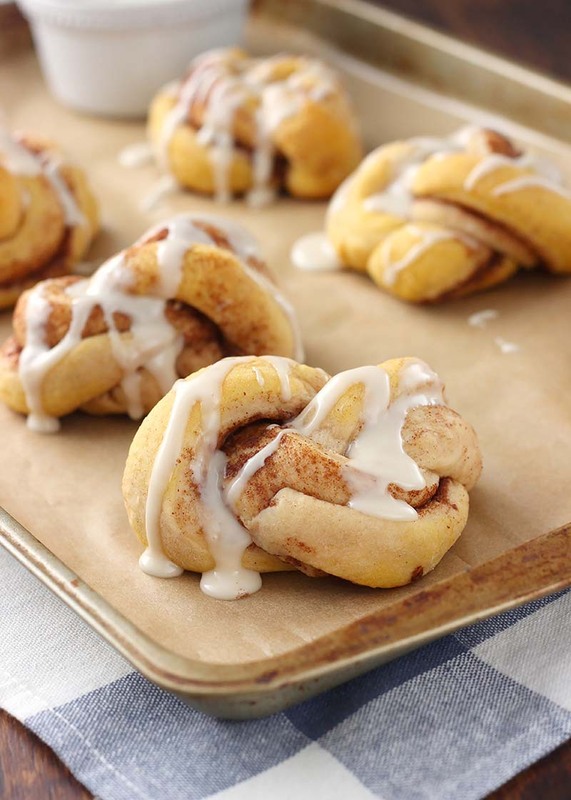 Soft, tender pumpkin cinnamon knots topped with a sweet maple drizzle! In the bowl of a stand mixer, beat together 4 cups flour, sugar, yeast, salt, cinnamon, nutmeg, and ginger. Add in eggs, butter, pumpkin puree, and milk. Beat until just starting to combine. With the mixer on low, add remaining 1½ cups flour. Replace paddle with dough hook and knead for 5-8 minutes, or until dough is smooth and starts to pull away from the sides of the bowl when mixing. If dough too sticky, add up to another ¼ cup of flour, one tablespoon at a time. Transfer dough to a bowl that has been sprayed with non-stick cooking spray. Cover with a clean cloth and allow to rise in a warm place until doubled in size, about 45-60 minutes. Prepare filling: In a small bowl, whisk together spices and sugar. Turn dough out onto a well-floured surface and gently punch down. Roll dough out into roughly a 24x10-inch rectangle. Spread softened butter over dough. Sprinkle evenly with spices-sugar mixture. (6) Starting with long side of dough, gently fold in half. Cut dough into 24 one-inch strips. Take each strip and tie it in a knot as you would a piece of string. Fold ends under the knot. Cover and allow to rise for 20-30 minutes or until knots are puffed and dough is very soft to touch. While dough is rising, preheat oven to 375°F. Bake knots for 10-12 minutes or until they just start to turn golden brown. Remove to a wire rack. Prepare glaze: Stir together confectioner’s sugar, milk, and maple extract until smooth. Add more/less milk to achieve desired consistency. Drizzle over the top of slightly cooled knots.